There are times when we crave for something delicious to break the monotony of home cooked food, and to relish our taste bud. Generally, the first thing that comes to our rescue is a Pizza. 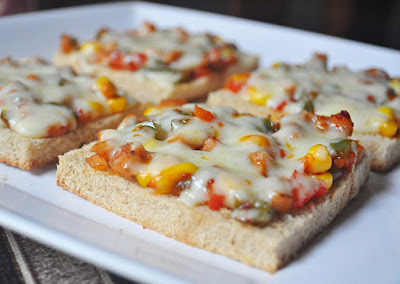 Pizza is an all time favourite snack for almost everyone. How great would it be if we could replicate the same delicacy at our own homes and that too at minimal cost because the delivered pizza comes with exorbitantly high rates. Wash and dice all the vegetables finely. You don’t want the raw flavours of these veggies to overpower the taste of cheese and other ingredients. So you’ll sauté vegetables beforehand until vegetables are tender and the oil starts to separate in the pan. 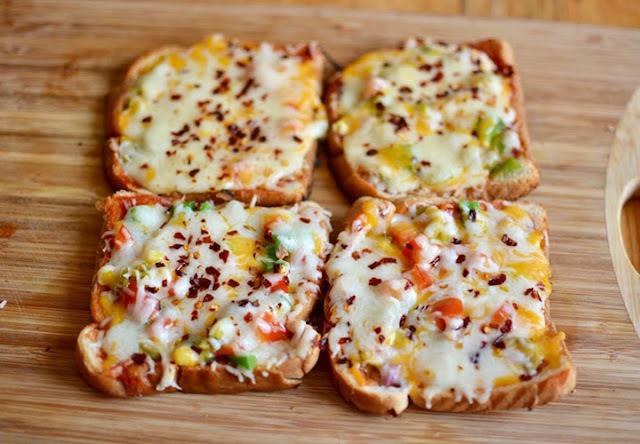 Now spread ketchup or Pizza sauce evenly on all the bread slices. And start placing the cooked vegetables on it. When you’re done with placing all the toppings on the bread slices, it is time for the magic ingredient i.e. grated mozzarella cheese. Cover the slices fully with this cheese. Grill it in your oven for 5-6 minutes or until your bread is crispy and the cheese begins to melt. For regular gas stove- you can also put your bread slices on the nonstick cookware and cover the pan with a lid. Make sure you brush your pan with some butter first to make the other side of the bread crisp and brown. Believe me, this would taste like any other pizza that you prefer buying from the market. Do try this simple recipe. I assure you, everyone would totally love it.